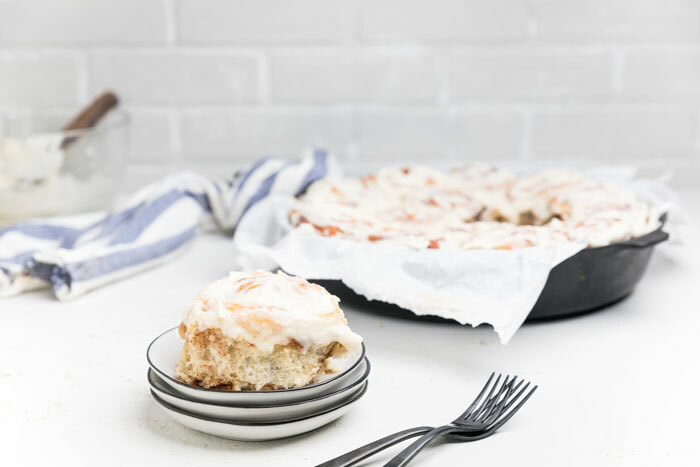 These dairy free cinnamon rolls with dairy free buttercream frosting are literally what your sweet tooth dreams are made of everyday. 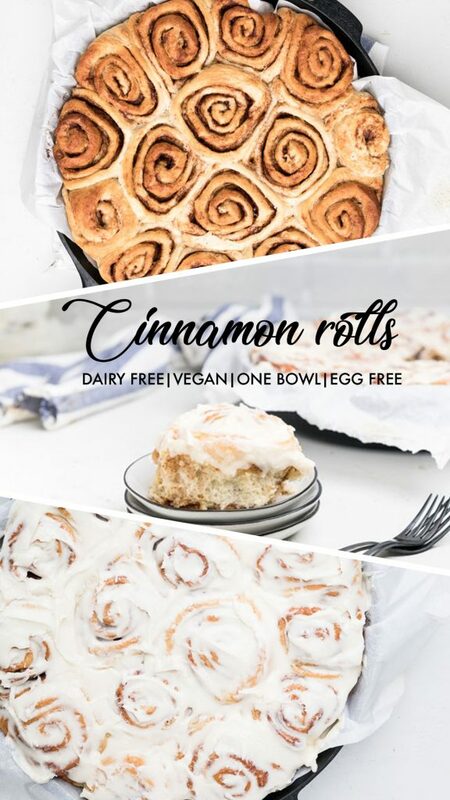 Try out these vegan cinnamon rolls today! I bet you can’t tell the difference and think it’s the best cinnamon roll recipe ever! If you’re like our family, cinnamon rolls are a fun, super special treat every once in a blue. When you go dairy free, you don’t want to feel like you’re missing out on anything. Honestly, you want to enjoy all the same things that you were able to have before. Luckily, you can now have the perfect dairy free cinnamon rolls with dairy free buttercream frosting. 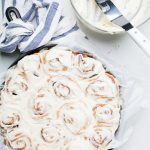 This homemade dairy free cinnamon rolls recipe has all the best components that make up the perfect cinnamon roll recipe. They are super fluffy and soft. Then, it’s topped with the most wonderful dairy free buttercream frosting. 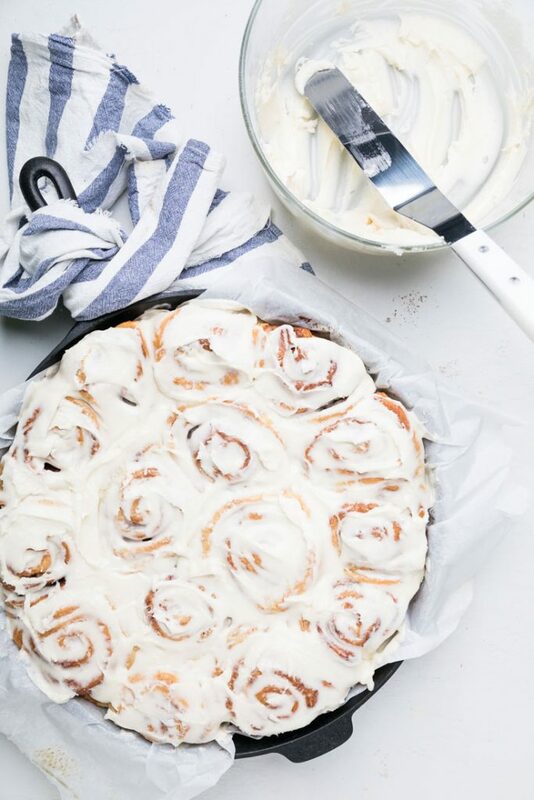 You won’t even believe that these are completely vegan cinnamon rolls. 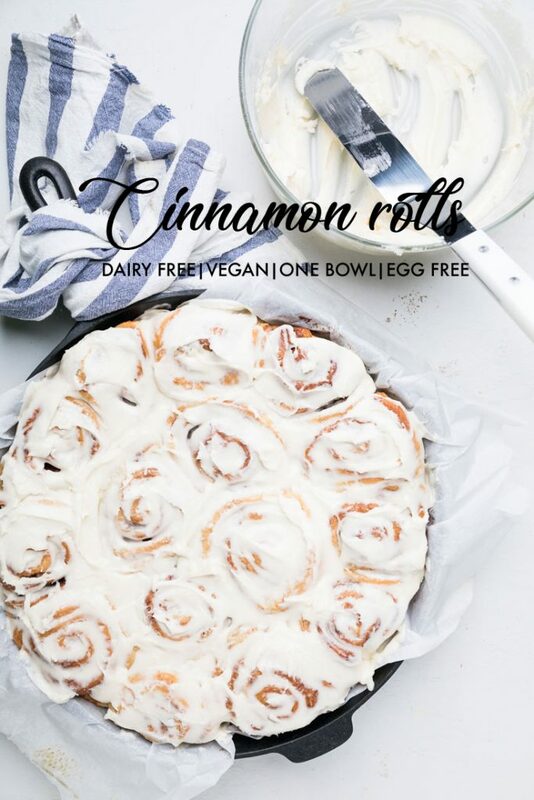 What ingredients do you need to make dairy free cinnamon rolls? You will also need frosting for these delicious dairy free cinnamon rolls. In the photos we are using our dairy free buttercream recipe, but you could also use our dairy free cream cheese frosting. 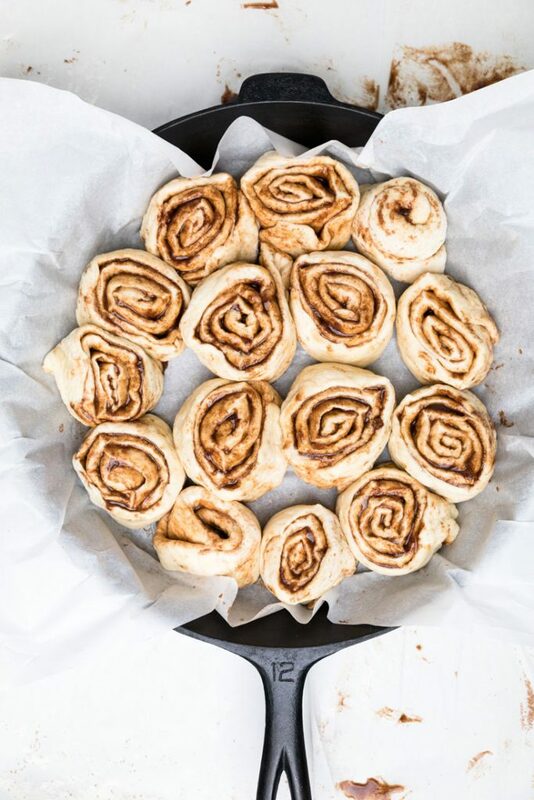 How to make homemade cinnamon rolls that are dairy free? 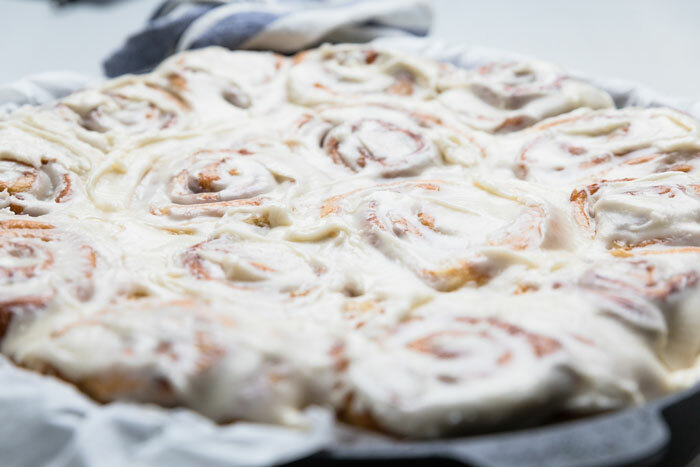 Cinnamon rolls from scratch are daunting to many, but if you follow this recipe, you’ll end up with absolutely delicious homemade cinnamon rolls. No, like for real. It will blow your mind away. One of the main reasons people usually get nervous about making a cinnamon roll recipe is that it contains yeast. Add to that you are trying to make a homemade, dairy free, vegan cinnamon rolls and cue freak out. But hold on….follow along and I promise deliciousness awaits you! The complete recipe and amount are below, but full directions with tips are right here. To start, you need to scald almond milk and vegan butter together. We found what worked best was Earth Balance soy free out of the ones we tried. You want it to be right at the boiling point, but not yet boiling. Then, let cool slightly while you get your other ingredients ready. Tip: If you want to be a perfectionist, the temperature needs to be at 110-115 degrees Fahrenheit when you add the yeast. Once the time is up, add in the bread flour and salt and stir to combine. Roll into a ball. Tip: We also tried this recipe with all-purpose flour and while you will still get cinnamon rolls, they will not be fluffy. We highly suggest using the bread flour for this recipe. Cover bowl with a damp towel and place in a warm place. We prefer to preheat the oven to 150 degrees F and turn off before placing inside. Let rise for one hour. Once risen, remove ball and place on a lightly floured surface. It’s really important that you touch the dough for these dairy free cinnamon rolls as little as possible. Using a rolling pin, roll dough into an approximately 17×25″ rectangle that is 1/4″ thick. Spread softened butter across rectangle evenly. Then, mix brown sugar and cinnamon together and sprinkle over top. Carefully roll cinnamon rolls into log from the longest side up. One completely rolled, place seam side down. Cut 15 even pieces. Place into a greased 12″ cast iron skillet lined with parchment paper. 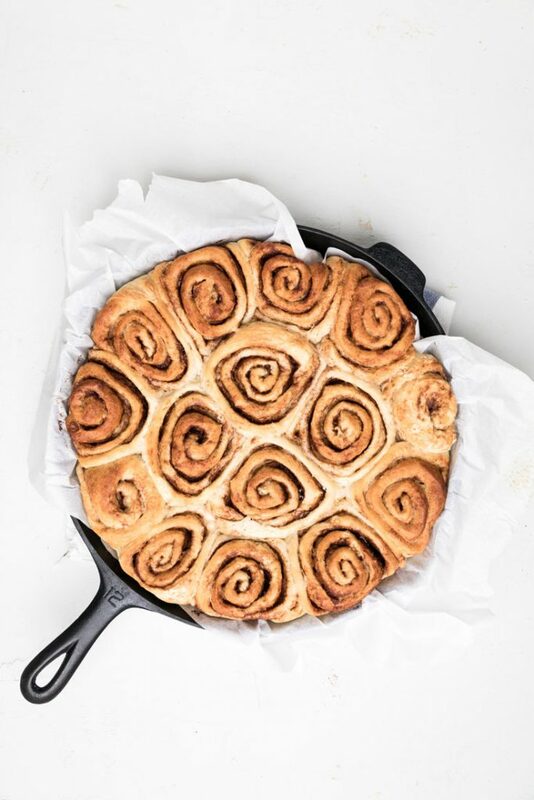 If you do not have this large of a skillet, you can use any baking dish that you have that will fit all 15 dairy free cinnamon rolls. Place back in warmed oven or warm place covered with a damp towel for another 45-60 minutes. Bake in 350 degree oven for 25-28 minutes. Remove and top with homemade dairy free frosting. What are other great dairy free breakfast ideas? Whether you are serving breakfast or brunch, these dairy free cinnamon rolls are perfect. However, if you’re looking for more than one dish, here’s some great ideas for your next dairy free meal. All of the below are dairy free and vegan breakfast ideas unless otherwise stated. Scald almond milk and vegan butter together. Pour into a large bowl with the vanilla, sugar, and yeast. Stir together gently and let sit for 10 minutes. Once the time is up, add in the bread flour and salt and stir to combine. Roll into a ball. Cover bowl with a damp towel and place in oven. Let rise for one hour. Once risen, remove ball and place on a lightly floured surface. Using a rolling pin, roll dough into an approximately 17×25″ rectangle that is 1/4″ thick. Spread softened butter across rectangle evenly. Then, mix brown sugar and cinnamon together and sprinkle over top. Carefully roll cinnamon rolls into log from the longest side up. One completely rolled, place seam side down. Cut 15 even pieces. Place into a parchment lined 12″ cast iron skillet lined with parchment paper. If you do not have this large of a skillet, you can use any baking dish that you have that will fit all 15 dairy free cinnamon rolls. Place into warmed (but off!) oven again with the damp town covering. Let rise again for 60 minutes. Remove from oven and preheat oven to 350 degrees. Remove and top with homemade dairy free frosting if desired. **Nutritional facts are just estimates. Values do not include optional frosting. Please utilize your own brand nutritional values to double check against our estimates.